The first Boeing 737-800NG aircraft was delivered to Swoop on May 22, marking a milestone as the airline prepares for the launch of operations on June 20, 2018. 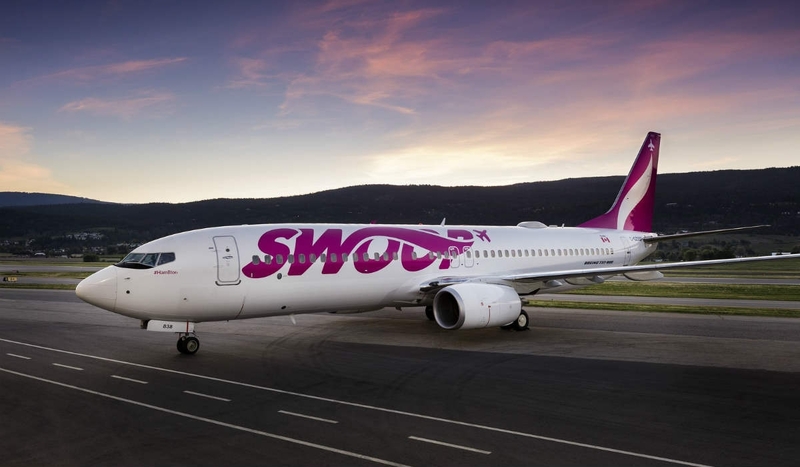 The Boeing delivery was also a chance for Swoop to show off its new livery, holding a magenta Swoop logo, and magenta accented tailfin and winglets. Swoop plans to operate a modern fleet of Boeing 737-800NG aircraft with blended winglet technology to improve aerodynamic performance and reduce fuel burn by as much as four per cent. The company explains this is key to its ultra-low-cost business model. With 189 seats, including 39 extra legroom seats offering an additional four to six inches of space, the aircraft interior features colour accents like embossed leather headrest covers, and bullnose strips. The aircraft interior is also outfitted with amenities including in-seat power, fully adjustable headrests, WiFi connectivity and in-flight entertainment – the latter two will be paid options for passengers. Swoop has named its first aircraft #Hamilton as a nod to its first airport base at John C. Munro International Airport in Hamilton, Ontario. Swoop plans to name the first four aircraft after people and places that have been integral in its launch.